I enjoyed a yumbo carb free casual cafe lunch with a girlfriend the other day. Now lunch need not mean sandwich or burger… and eggs is not only the domaine of breakie. We chose an all day breakfast cafe. Actually our first choice of cafe had just finished breakfast so we moved. I had ‘green eggs’ – eggs scrambled with feta, spinach & pesto. It was served with toast so I asked for no toast and mushrooms instead. No problem. 1. Plan what and where. Don’t end up at a burger joint and expect you’ll be ok with a boring, unsatisfying green salad while everyone else chows down hearty burgers and crispy fries. Ordinary or ‘normal’ is now unhealthy, unfit and over-weight. If you want extraordinary or simply just healthy, it’ll take extra-ordinary behaviour. I like to think the more I (and you) ask, the sooner our preferences will be available as a standard (fuss-free!) order. SWITCH rice for cauli-rice. The same applies for mashed potato. Prepare cauli as you would spuds – so peel and cook till nice and soft. For ‘rice’ mash to desired consistency with potato masher and season with sea salt and pepper. For ‘mash’ you’re going to work a lil longer mashing to get a smoother consistency. Part way through I like to add some Nutritional yeast and season. The possibilities are limitless. Avocado mashes in well too. For some colour half cauli and half broccoli works well too. SWITCH a burger bun for 2 portobello mushroom caps. SWITCH potato chips for crispy Brussels or Kale chips. SWITCH flour in your pancakes for 3 beaten egg whites and a scoop of protein powder. Add some cinnamon and even nut butter and these things rock! 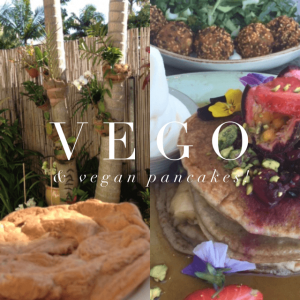 If you’re 100 plant based then more and more cafes have you covered. This picture shows my old (pre-vegan) pancakes v. the super delicious vegan pancakes @speedoscafe! SWITCH pasta for a bed of greens like: asparagus, snow peas, green beans. Or, use julienne zucchini or winter squash. Yes, it may be a whole different way of thinking about food however it is the mindset that people who stay fit and lean long term have. It absolutely does not mean your food needs to be bland and boring, simply that you take more than just taste and ease into account. 1. How do you know it’s time to eat? Effective strategy: when I feel hungry or because I have an eating schedule and I know I’m scheduled to eat 3 nourishing meals plus one great snack every day. 2. How do you evaluate options? 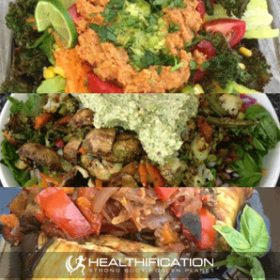 Effective strategy: whatever fuels my body best – whatever feels the leanest, lightest and gives me the most energy. 3. How do you know it’s time to stop eating? Effective strategy: when I’m about 75% full or when there’s still food on the plate and I feel comfortable pushing that plate away with some food still on it or when I’ve eaten the amount that I’ve planned to eat, whether it be by macronutrient breakdown/serving size/calories. ALSO, take the time to get creative with herbs, seeds, nuts, spices. I love coriander or basil in my salads. Cinnamon and nut butter to add depth to my shakes made with water instead of milk. Chili and paprika in my omelettes. AND, get clever with your fast meal preparation. 1. Buy premixed pre-washed salad greens. 3. Add mixed frozen veg. 4. Now add some fresh prepared veg of choice. Veggie Burgers. Serve with heaps of extra veg, avocado and your portobello caps. Vego Chili Mince. Great for taco’s or nacho’s, simple swap the carb component for iceberg caps or witlof and get extra generous with your veg. Frittata. Switch potato for cauli in your frittata and serve with extra green veg. In closing I’m absolutely not a carb hater – there are some high value for your body + super yumbo carbs. The thing is a lot of the carbs we consume are purely out of habit or convenience. 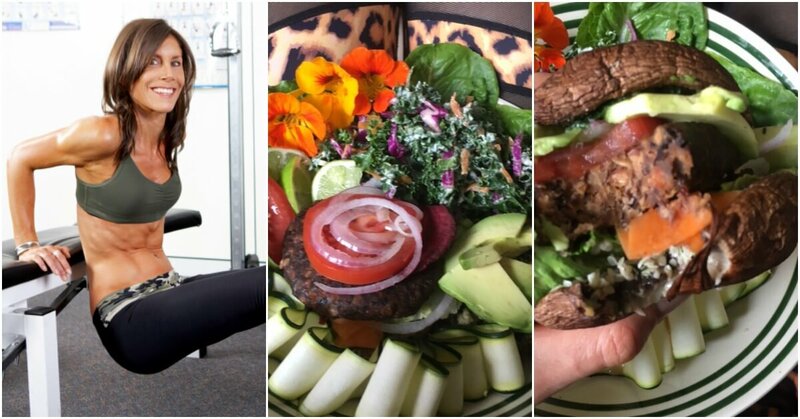 The sustainable approach to staying fit and lean without restrictive dieting is to be conscious of WHAT carbs you’re consuming when and choosing the carbs you enjoy most at set times rather than mindlessly consuming. If you liked How To Cut Carbs To Lose Weight you’ll also like: Turn 3 Mass Cook-ups into 9 Different Meals.